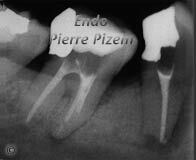 Dental operative microscope root canal procedure (Microendodontics). Case Study Number 392346. Referred patient has had two root canal procedure previously done on this very same tooth and pain was still present for weeks. Extraction and an implant supported crown has been suggested but patient still preferred to once more try to save his own tooth. 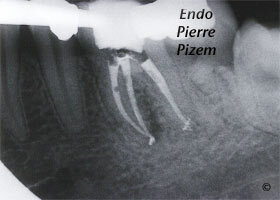 The dental operative microscope allowed the uncovering of an extra canal ramification during the endodontic procedure. 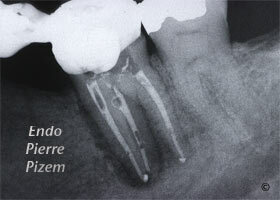 Pain subsided immediately after treating that previously under seen part of the root canal system. 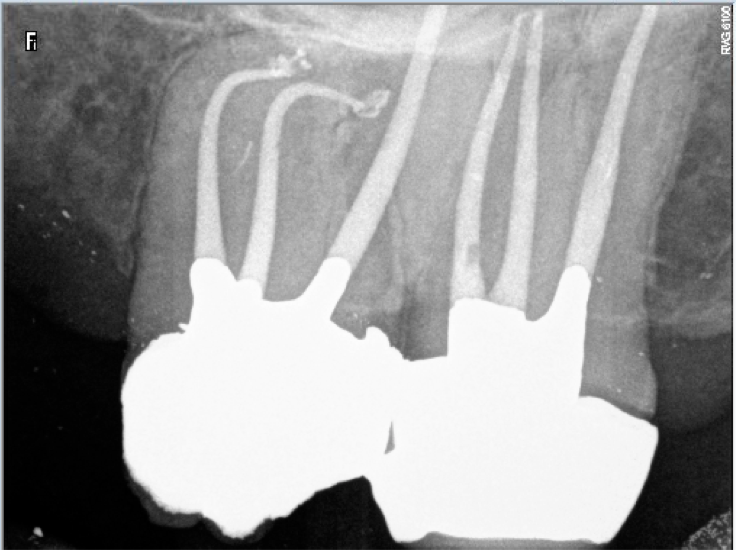 This a class 3 level of difficulty root canal procedure which means that a root canal treatment such as this one is difficult and time consuming to perform. Nevertheless, treating that extra canal was all that was needed to save that tooth. No need for a dental implant here. 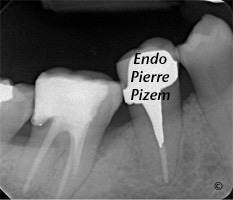 Microscope in Endododontics. Case Study Number 513236. We have been confronted to this three rooted mandibular first molar (Radix Molar or Radix Entomolaris), a rare anatomical variation of teeth, where a third supernumerary root is located distolingually in mandibular molars. 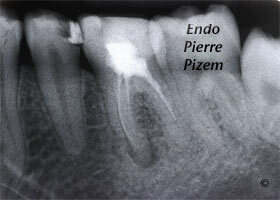 Root canal system calcifications and a small radius root canal curvature with an “S” form made this endodontic procedure a complex one. 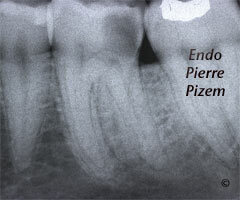 The prognosis of dilacerated teeth that require endodontic treatment … is difficult to predict before treatment, and in many cases, the prognosis will not become evident until the practitioner has undertaken initial endodontic treatment to determine wether the canal can be negotiated completely and then adequately disinfected and filled. 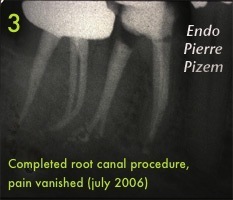 In that specific case, endodontist operative microscope was most helpful when striving to find the fourth canal entry in distal root, allowing for us not to omit the fourth deeply embedded root canal. 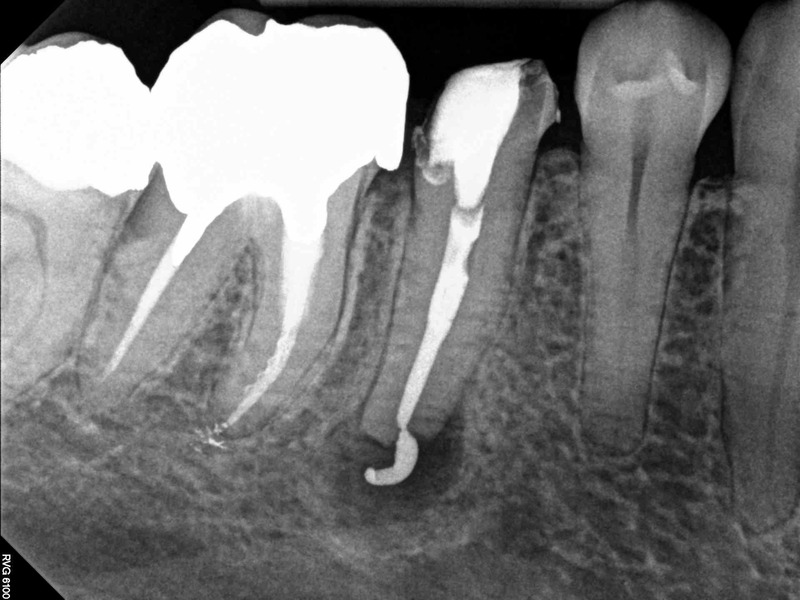 This microendodontic case study enlightens how dental operative microscope may assist the practicing dentist into a more secure root canal procedure for his patient. Root canal preparation and filling as been completed with stainless steel K endodontic files in conjunction with the Pro Taper system from Dentsply. 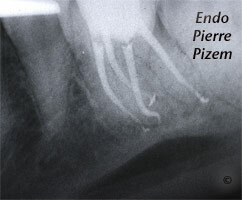 Root canal obturation as been completed with gutta percha and Pulp canal Sealer from Kerr using the Schilder-Yu condensation technique. Sixty years old patient presenting with an abscessed mandibular molar. 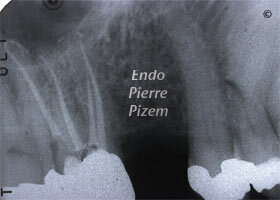 Diagnosis: Persisting disease after (25 year old) root canal treatment. 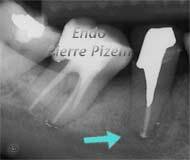 A crown and two post removal where necessary in order to gain access to root canal system for retreatment. 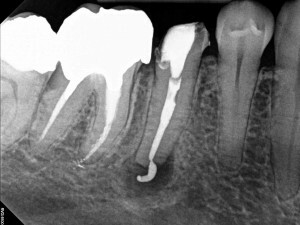 First apointment: Crown and post removals plus root canal filling retrieval and calcium hydroxide insertion as a medicament. 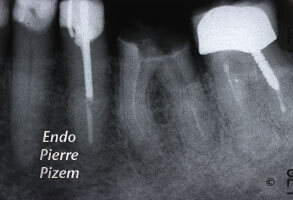 Second apointment: Calcium hydroxyde removal, irrigation, drying, final canal obturation gutta percha and Pulp Canal Sealer. Provisional filling material: Clip (not radiopaque) from Voco. Tooth is now symptom free and it is now ready for a post and a PFM crown. 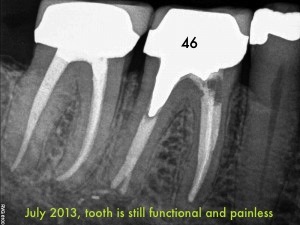 A complex root canal retreatment does not have to mean extraction and replacement by a dental implant. A research study by Farzaneh et al. 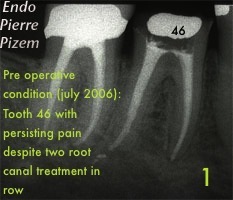 on treatment outcome in endodontic found an orthograde root canal retreatment success rate of 93% . A new Dental Operative Microscope (D.O.M.) 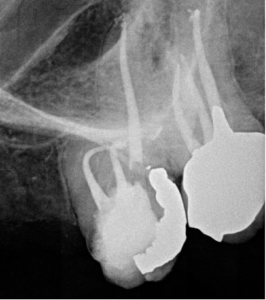 assisted root canal treatment on a maxillary second molar with calcified canals. 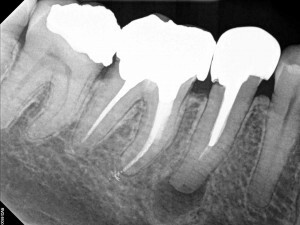 Radiographic findings: Dystrophic calcifications in the whole canal system are completely obliterating the pulp chamber. 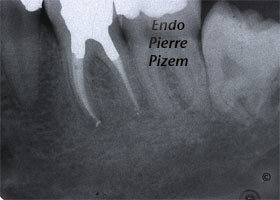 It can be expected that the root canal entries are completely embedded in a mass of adherent pulp stones. 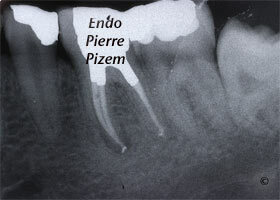 Endodontic procedure problem number one to solve: Locating all four root canal entries without lateraly perforating the root and without destroying to much sound tooth structure in order to keep tooth restorable. Endodontic procedure problem number two to solve: Cleaning and shaping located root canals without loosing patency, without breaking an endodontic file and without perforating the root. 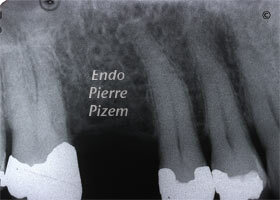 Thus, the difficulty level of this endodontic procedure can be considered as very high. A few years back, when there was no surgical operating microscope in our dental practices and only a handfull of daring pioneers in microendodontics, removing this tooth and replacing it by an implant supported crown would have been a good option to consider in most instances. Times have changed. In order to save that tooth, calcified dentin must be carefully removed with long thin ultrasonic tips under the high magnification of dental operating microscope (OPMI PROergo from Carl Zeiss). 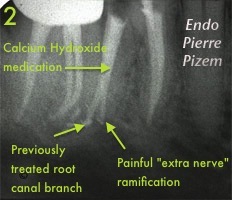 No rapid technique exists for dealing with calcified root canal system. Root canals has been shaped and cleaned with Protaper endodontic files and 06, 08,10 K in combination with chelating agent (RC PREP). 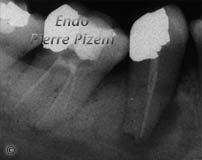 Canal system has then been filled with Pulp Canal Sealer and Gutta percha laterally and vertically condensed. Provisional filling material: Cavit TM. Symptoms: Acute pain to pressure, patient is eating on the opposite side. Root canal was done three years ago. Tooth root canal system has been retreated (reshaping and cleaning) and calcium hydroxide paste inserted as an intracanal medication, symptoms subsided. A week later, final root canal obturation with gutta percha and pulp canal sealer completed the root canal procedure, an amalgam post and core build up was done during the same appointment to seal coronal part of the tooth. Six months recall shows a complete healing. 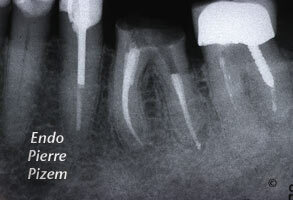 Patient’s dentist can prepare the tooth as an abutment to receive a crown. 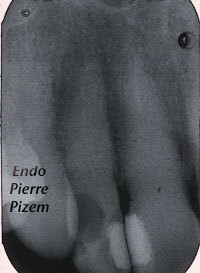 Patient was told seven years ago to remove lower right premolar and replace this tooth by an implant supported crown. Lack of periradicular tissues implied a guided tissue regeneration which, in turn implied a bone curetage close to the mental foramen. Estimated health risk: A possible permanent nerve paresthesia caused by a curetage or by an implant surgery close to the mental foramen on a patient with a narrow crestal mandibular bone. A possible failure of guided tissue regeneration which in turn, would impair implant osseointegration (or simply make the implant surgery impossible). Clinical examination revealed a mobility level of 2 and a sinus tract. Our findings on radiographic appearance: a large but a localized bony defect and a tooth that needed a root canal re-treatment. 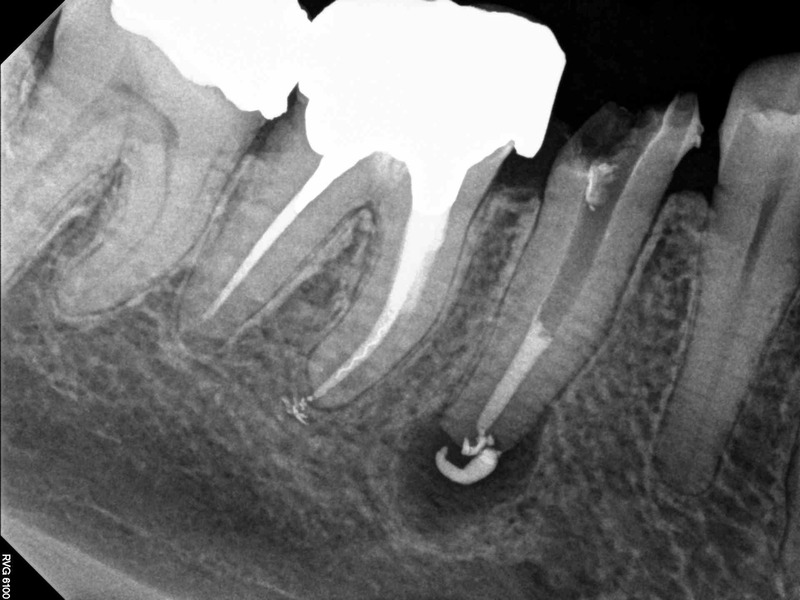 Our suggestion to the patient: To put aside the implant surgery and to invest in a root canal re-treatment with a few Ca(OH)2 replacements. The patient had to be patient (and faithful) for a few months in order to monitor progressive periradicular tissue healing. Results: Per and post operative control X ray films show a progressive, then complete healing of periradicular bone tissue. In this case, root canal retreatment proved to be a safe predictable way of saving that tooth at half the cost of an agressive implant surgery. 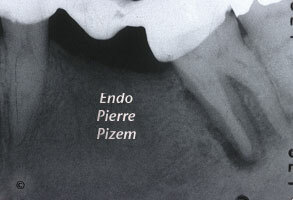 Now, 7 years later, the tooth has it’s own casted post, a PFM crown and it’s mobility level came back to zero. 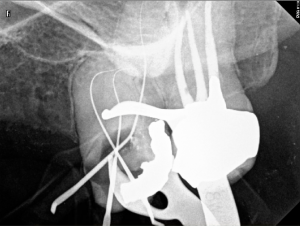 And above all, patient is now completely safe from any paresthesia risk. A new Dental Operative Microscope (D.O.M.) Assisted Root Canal Treatment in a Calcified Maxillary Lateral Incisor. Radiographic findings: Dystrophic calcifications in the whole canal system are completely obliterating the pulp chamber as well as the root canal itself. 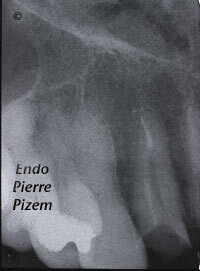 It ca be expected that the root canal entry is completely embedded in a mass of adherent pulp stones. 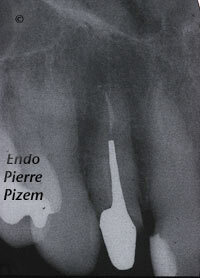 Endodontic procedure problem number one to solve: Locating root canal entry without lateraly perforating the root and without destroying to much sound tooth structure in order to keep tooth restorable. 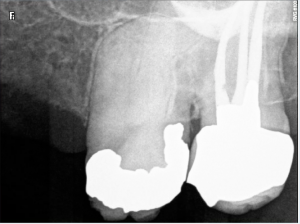 Endodontic procedure problem number two to solve: Cleaning and shaping located root canal without loosing patency, without breaking an endodontic file and without perforating the root. 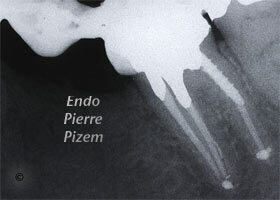 This is an extreme endodontic procedure. 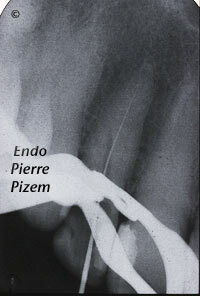 A few years back, when there was no surgical operating microscope in our dental practices and only a handfull of daring (and caring) pioneers in microendodontics trained by Dr Garry B. Carr (who is an endodontist acknowledged to me as the “father of microendodontics”), removing this tooth and replacing it by an implant supported crown would have been a good option to consider in most instances. Times have changed. In order to save that tooth, calcified dentin must be carefully removed with long thin ultrasonic tips under the high magnification of dental operating microscope (OPMI PROergo from Carl Zeiss). 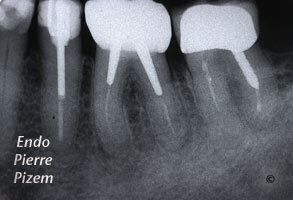 No rapid technique exists for dealing with calcified root canal system. 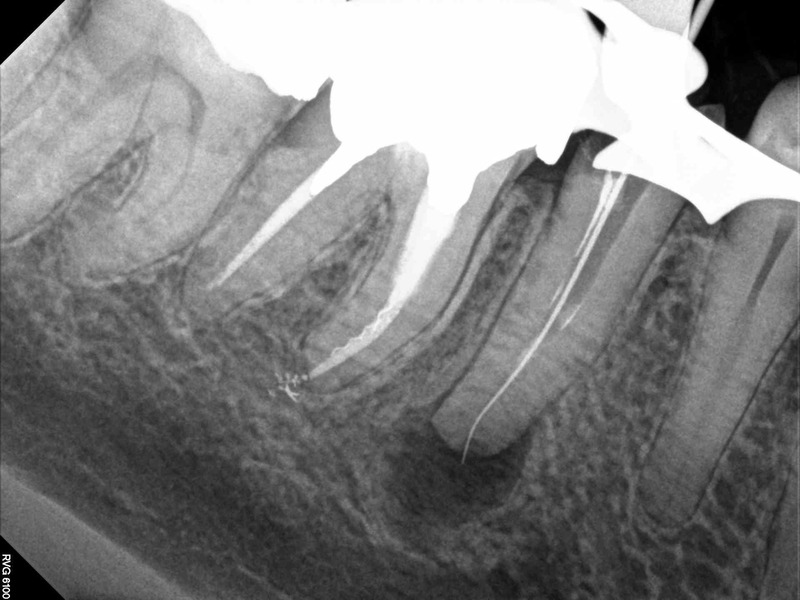 In this specific case ultrasonic tip went off centered creating a groove in canal toward distal, X ray dental film taken during the root canal procedure alowed us to notice this and alowed us to correct the tip orientation before making a perforation. This groove has been filled within the canal itself with Geristore from DenMat. Root canals has been shaped and cleaned with Protaper endodontic files and 06, 08,10 K in combination with chelating agent (RC PREP). Canal system has then been filled with Pulp Canal Sealer and Gutta percha laterally and vertically condensed. Provisional filling material: ProTemp (A provisional crown with anchorage). Last X Ray dental film is a post operative control, the referring dentist asked us to make and cement a casted post in order for him to cement a planned fixed crown.